﻿ Ground Truth Briefing: Is Climate-Related Migration a National Security Issue? Ground Truth Briefing: Is Climate-Related Migration a National Security Issue? Experts predict that climate change will spur some people to leave their homes and countries. How will national security be affected as a result? In this week’s podcast, ECSP’s Roger-Mark De Souza leads a Ground Truth Briefing at the Wilson Center on this question. De Souza was joined by Maxine Burkett, a Wilson Center global fellow and associate professor of law at the University of Hawaii at Mānoa; Joseph Cassidy, a Wilson Center fellow and former director for policy, regional, and functional organizations at the U.S. Department of State; and Sherri Goodman, a Wilson Center fellow and former deputy undersecretary of defense for environmental security at the U.S. Department of Defense. One of the fundamental problems when talking about climate change and migration is a lack of universal definitions and international frameworks, says Burkett. The term “refugee” has a legal definition and obligations that go with it that do not apply to people displaced by climate change. A more appropriate term for most situations is climate-induced migration or displacement, yet “climate refugees” is commonly used by advocates and critics alike. Further, determining how climate change has factored into displacement or a person’s decision to migrate is an inexact science. Cassidy pinpoints three categories of risk associated with climate-induced migration and displacement: direct risks, indirect risks, and third-order risks from how we respond. On the one hand, Cassidy says, it can be difficult to mobilize high-level officials and policymakers to address many of the direct and indirect risks, like increased demand for humanitarian assistance (a direct risk) or disruptions to the global economy from new flows of people (indirect). U.S. policymakers tend to be focused on immediate crises and hard power, he says, a byproduct of how the national security apparatus is structured. The United States military has, for its part, recognized climate change as a “threat multiplier” for several years, says Goodman, repeatedly noting the associated risks of climate change and displacement in strategic documents. New Secretary of Defense James Mattis has acknowledged climate change as a driving force for instability in both fragile and stable regions of the world. The military has taken note for good reason, Goodman says. As the country’s “911 force,” it is often first on the scene for humanitarian disasters, public health emergencies, and other crises. Goodman says the Pentagon now needs a long-term strategic approach to working with other U.S. agencies and civilians to address climate-related issues like migration and displacement, as many associated problems cannot be solved by the military alone. Climate-related impacts on migration and political instability are expected to get worse, especially in hotspots with dense populations, like South Asia and Southeast Asia, says Burkett. But there is a lot we don’t yet know. “If we get a better sense of the scope of the issue, we can at least plan for it,” says Burkett. “But right now, we don’t even exactly know how many individuals [or] communities are going to be affected.” Such uncertainty makes it difficult to create policy responses that will actually reduce or mitigate violent conflict. International frameworks, such as they are, are not well structured to deal with this nexus of issues, says Cassidy. He notes that the many government, non-government, and multilateral organizations that make up the global climate and humanitarian regime each has their own “particular, parochial” perspective, resulting in a lack of cohesion. The international community needs to solve the underlying long-term issues that force people to move, he says, and this includes climate change but also conflict. In a guide for policymakers released last year, Navigating Complexity, ECSP outlined several core principles to preventing violence related to climate change and migration, including strengthening local institutions that handle land and other resource rights, avoiding sensationalizing migrants as security risks, and adopting a “do no harm” (though not “do nothing”) approach to climate and humanitarian interventions. These principles, in conjunction with enhancing predictive capabilities, would help the United States and partners better prepare for associated national security risks. This Ground Truth Briefing was recorded at the Wilson Center on February 28, 2017. Sources: United States Joint Forces Command. 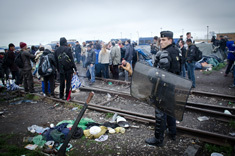 Photo Credit: A migrant camp in Calais, France, May 2014, courtesy of flickr user Squat Le Monde. Security Links: An Emerging Congressional Common Ground on Climate Change?